Tales of magic almost always include "death spells" among the abilities of sorcerers. These curses don't merely wound, control, immobilize, or incapacitate their victims – they kill in one shot. 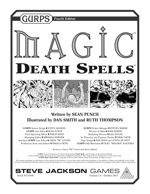 GURPS Magic: Death Spells offers 48 genuine death spells spanning every college of magic. Each has its own strengths, weaknesses, peculiarities, and colorful effects, giving villainous NPCs and high-powered PCs alike their choice of wizardly firepower. Introducing death spells into an existing campaign without upsetting game balance . . . or players. Defenses against death magic, to protect beloved PCs and important NPCs from a premature demise. Practicalities surrounding the aftermath: Is there a corpse? Does the death look natural? Can the victim be resurrected? Do a victim's possessions survive? Advice on creating your own death spells, including class, college, difficulty, prerequisites, casting time, energy cost, and drawbacks – and how the magic kills! Thoughts on related topics: death-aspected mana, death as a magical college, death spells for clerics, and even magical suicide. Let's face it, when the good guys need scaring and the bad guys need slaying, a fireball is clumsy, predictable, and just not deadly enough. Break out the forbidden lore of GURPS Magic: Death Spells and let the chills and kills commence! 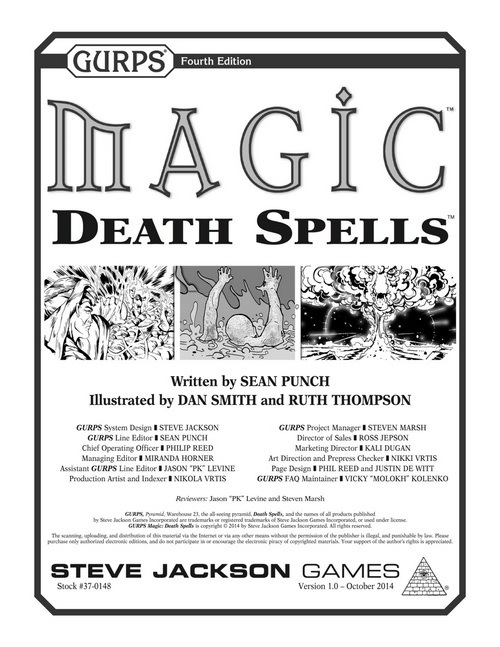 GURPS Magic contains the core system needed to use Death Spells. Do damage to a lot of targets with the 50 new spells contained within GURPS Magic: Artillery Spells. For another collection of specialized magic, check out the flora-based arcanum of GURPS Magic: Plant Spells.